Japanese artist Sebastian Masuda, founder of kawaii fashion line 6%DOKIDOKI, is one of the hottest stars on Japan’s pop culture scene. 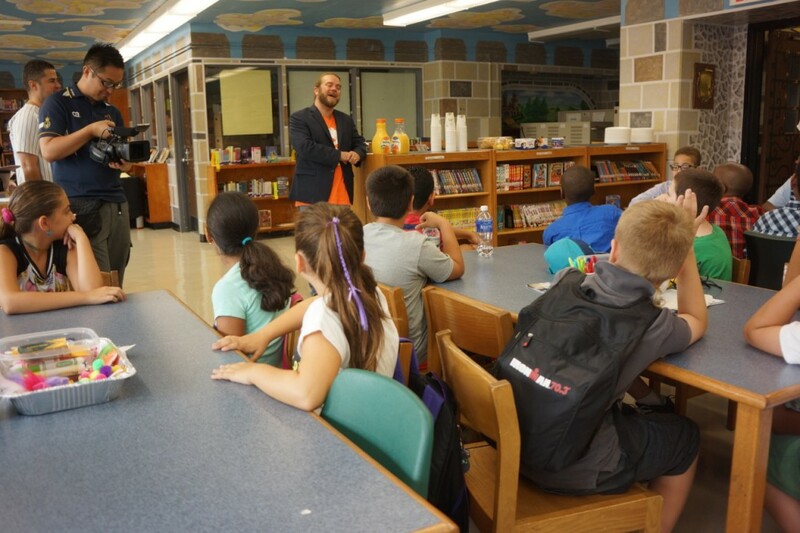 His celebrity status may not have been immediately evident to sixty incoming sixth graders at John Ericsson Middle School, but they still welcomed him with enthusiasm. 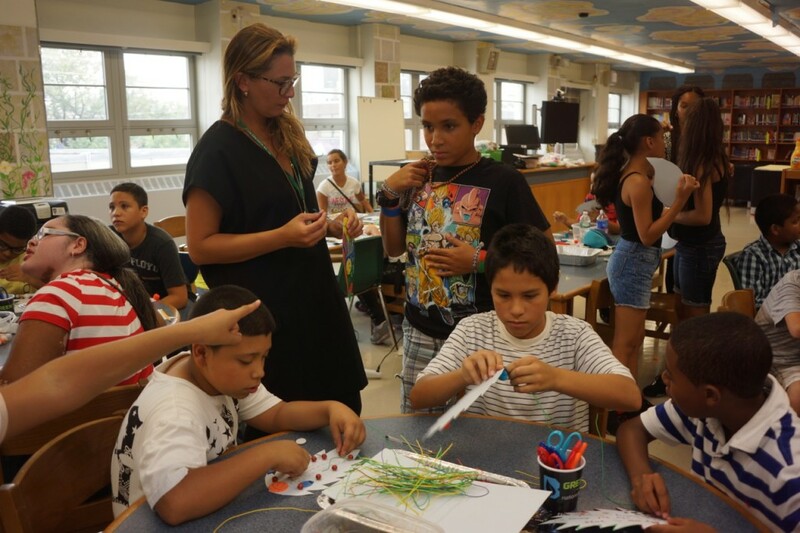 Masuda visited the school in Greenpoint on August 31 to lead a workshop as part of his Time After Time Capsule project and in conjunction with Waku Waku +NYC, a new Japanese pop culture festival that took place August 29 and 30 in five venues across Brooklyn. 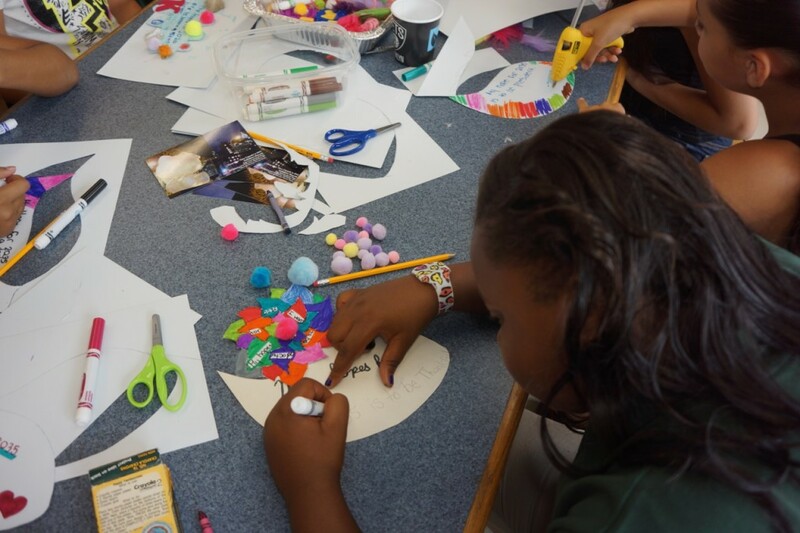 The ten- and eleven-year-old students gathered in the school’s library to create colorful artwork that Masuda eventually placed in his Hello Kitty sculpture that will sit at Dag Hammarskjold Plaza until Sunday, September 13. The nine-foot, hollow Hello Kitty sculpture is just one in a series of Masuda’s ongoing international art project, Time After Time Capsule, where the artist works with communities to add personal objects that can be seen through the sculptures’ translucent material. Last year Masuda created Miami Bear at Art Basel in Miami Beach. The bear sculpture, which is significantly smaller than Hello Kitty, made the journey north to enjoy the Waku Waku +NYC weekend in the sun at Transmitter Park. All of Masuda’s Time After Time Capsule sculptures, filled with mementos from around the world, will reunite in Tokyo for the 2020 Olympics. 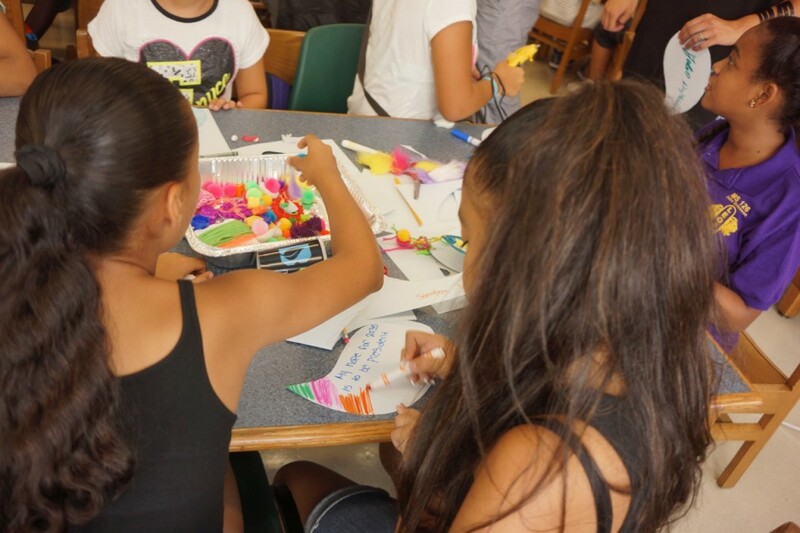 At the workshop at John Ericsson, Masuda instructed the students to create artwork and include messages that reflected their hopes and dreams for twenty years in the future, when his Time After Time Capsules are opened in the year 2035. “What you’re going to do today will seen in Tokyo in twenty years when the capsule is opened. 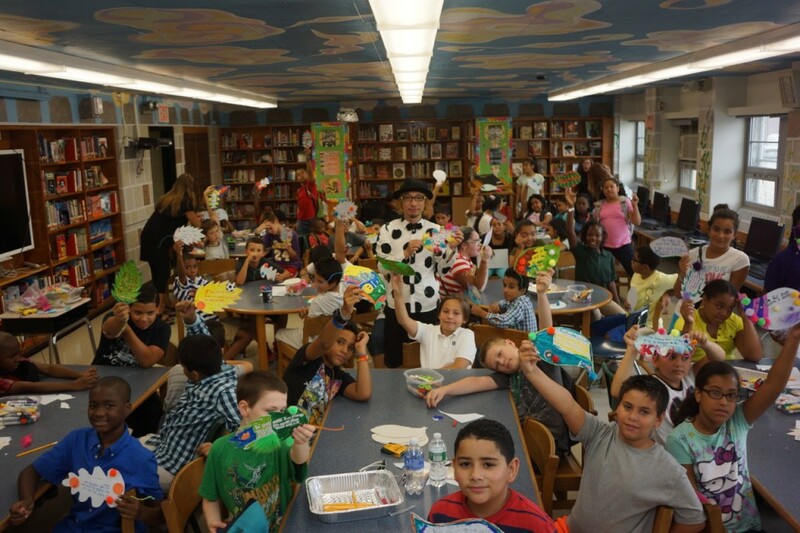 Isn’t that exciting?” John Ericsson’s principal, Maria Ortega, asked the students. Ortega warmed up the room by describing “waku waku,” the Japanese term for being tremendously thrilled or excited beyond belief. 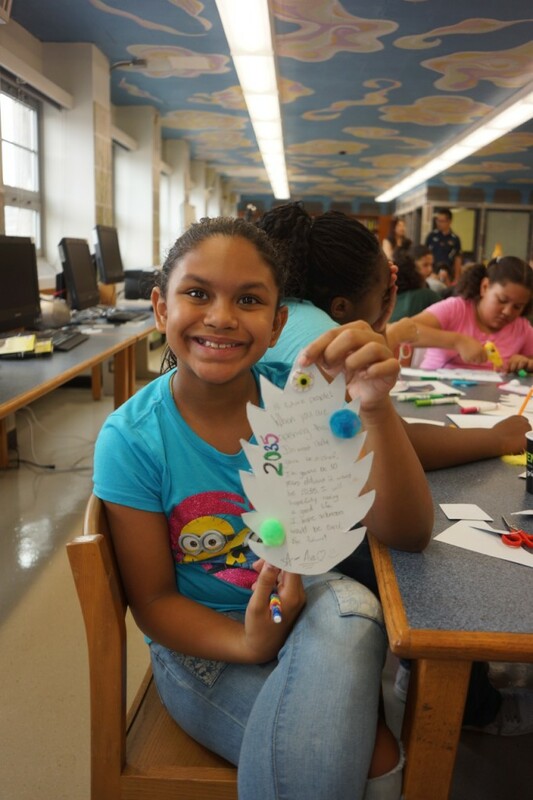 Because John Ericsson is a magnet school for environmental engineering, Ortega chose a leaf pattern to be the basis of each student’s artwork. They wrote their individual messages on their leaf patterns, and then decorated them with colorful string and knick-knacks provided by Masuda. 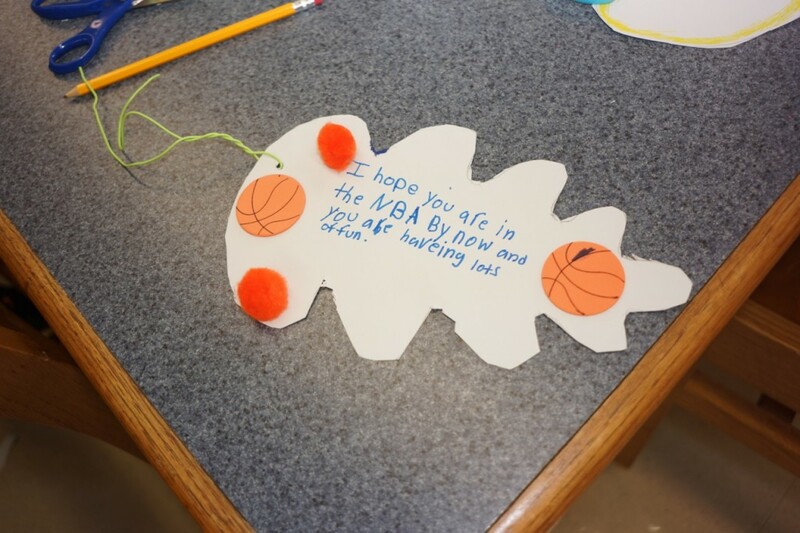 The students’ messages ranged from hoping the world was free from cancer and other diseases to personal goals of becoming the President of the United States or an NBA star. 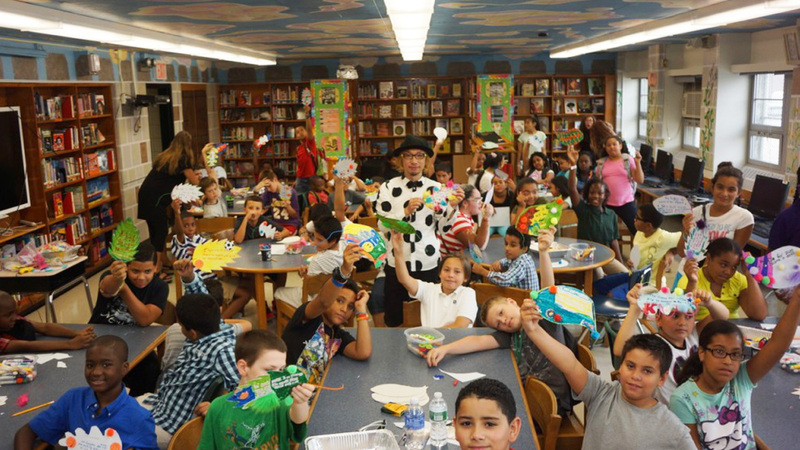 John Ericsson’s art teacher, Nina Fagiola, went from table to table, cheerfully praising the students on their selection of colors and gently coaxing others who were having difficulty thinking about life twenty years down the road. “I don’t even want to think about being 30 years old,” said one student. 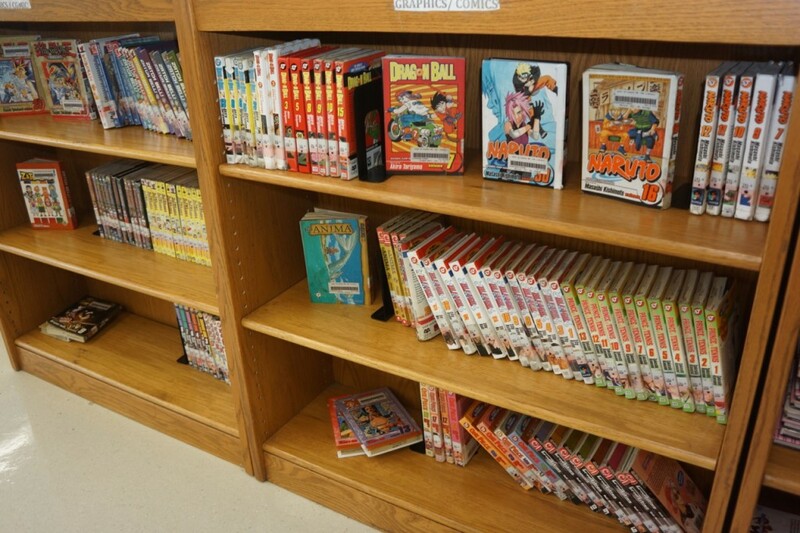 One bookshelf in the library is dedicated to Japanese manga such as Inuyasha, Prince of Tennis, and Dragon Ball Z, much to the delight of Justin Cook, a Texas-based voiceover actor who is Raditz, Super Buu, and Dende in the Dragon Ball series. 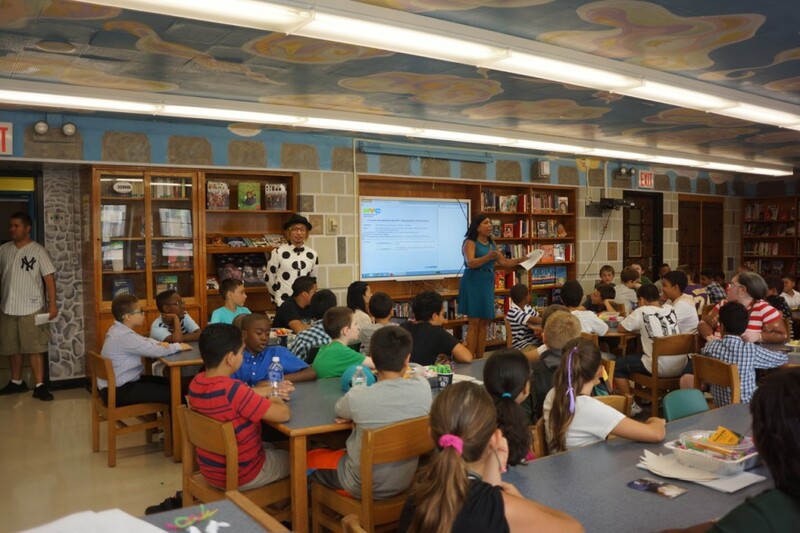 Cook participated in Waku Waku +NYC and visited John Ericsson to say hello to the students. A producer and cameraman from NHK were also there to document the event, which was the result of a collaboration forged by Ortega and Chikako Ichihara, the President and CEO of Azix Inc., the company that organized Waku Waku +NYC. In 2014 John Ericsson students participated in a national chess tournament in Louisville, Kentucky, where they placed 5th, 7th, and 12th; a space camp in Huntsville, Alabama; and a US Navy program to build and race underwater robots at UMass Boston. Months before Waku Waku +NYC took place, Ortega went to the Brooklyn Chamber of Commerce because the school fundraises for events such as these. Ichihara had already introduced herself to the Chamber, seeking support during the planning stages of the J-pop festival. “I went there to look for funders, and while I was looking for funders, I found Chikako,” says Ortega. Ichihara connected Ortega to Masuda, who had visited other schools in Manhattan to conduct similar workshops for the Time After Time Capsule. Masuda was able to share a morning of art and culture with the group of students from John Ericsson, whose demographic is predominantly Hispanic. These students may or may not travel to Japan, but we know that the artwork and messages that they created with Masuda will. To see more pictures from the workshop, please visit JapanCulture•NYC’s Flickr page. Disclaimer: The parents of all participating students signed release forms provided by John Ericsson Middle School in acknowledgement that the students would be photographed during the event.